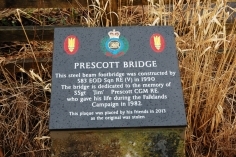 In March 2013 it was reported by the Milngavie & Bearsden Herald that the bronze plaque in memory of SSgt Jim Prescott CGM RE who was killed in action on 23rd May 1982 whilst attempting to render safe an unexploded bomb aboard HMS Antelope had been stolen. In June 2013 John Phillips DSC – who was with Jim Prescott when he was killed – was contacted by his daughters making him aware of the theft and asking if anything could be done to get it replaced. The word quickly spread amongst the Royal Engineers Bomb Disposal “family” and Falklands Veterans. It was agreed that a replacement plaque was required and donations started to arrive immediately. Within four weeks a total of £2515 had been raised. It was decided that the replacement plaque was to be made of granite, to reduce the risk of it being stolen again. A plaque was commissioned in August 2013 and completed at the end of November 2013. The original wording was used with an additional sentence stating when and why it had been replaced. 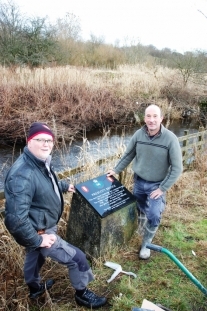 The completed plaque was shipped to Balfron Nr Glasgow Scotland in January 2014 where it was installed on the original plinth on Sunday 9th February by Graham Woods a local builder assisted by a former member of RE Bomb Disposal, Fraser Phillips. Both men gave their time and materials free of charge. We are all extremely pleased with the end result, which is a fitting tribute to a very brave man. We are also delighted that Rab Craig a Church of Scotland Minister at Stow Brae Kirk, Paisley – who also served in Royal Engineers Bomb Disposal when in the Army – has agreed to dedicate the plaque. The dedication will take place at a time convenience to the family and those involved, getting as many as possible to attend. This was a magnificent response”. The exploits and courage of Jim Prescott during the Falklands War are legendary within the Royal Engineers and the Navy and the swift and generous response was therefore not surprising. The money was donated by former colleagues, friends and members of the HMS Antelope ships company of 1982. Jim was killed on HMS Antelope whist attempting to render safe an unexploded bomb. Once all costs have been met the balance of the money raised will be donated to the HMS Argonaut Memorial Fund for a memorial to be built at the National Memorial Arboretum at Arewas Staffordshire. Very fitting as Jim Prescott assisted in rendering safe a 1000lb unexploded bomb aboard HMS Argonaut – saving the ship – the day before he was killed.